A cold has decided to attack my face tonight, so I can't breathe. Which makes me not want to go to bed, because it is way harder to breathe laying down. I am going to have to quadruple my pillows. I just took a zyrtec and a handful (or 5) of m&m's, so I should feel better soon. My parents are having a garage sale tomorrow, so we brought some stuff over to sell. 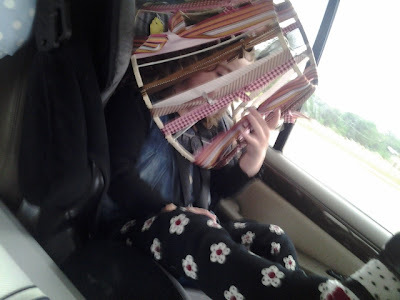 Katie had fun with my lamp shade in the car. She also hit a HUGE milestone tonight! 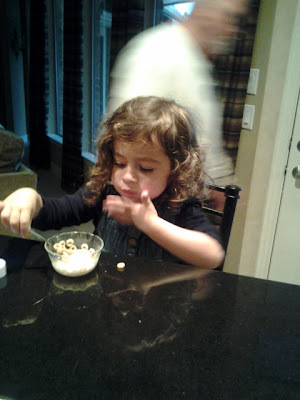 She ate cereal with milk! She has never wanted to try it before, but Nonni suggested it, so she was game. My dad's the blur in the background. This will open up a whole new (messy) world for her! 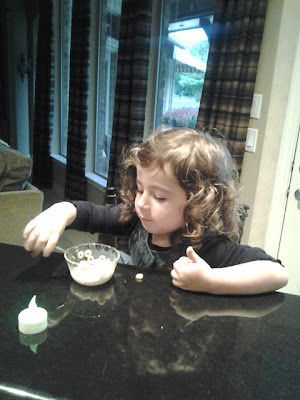 I think cereal is just about my favorite food, so I am happy for Katie to experience it the way God intended. After she ate, we told her it was time to go. Then she told her Nonni, "I have to go now!" then she told her Grampy, " I have to go, but don't cry, OK?!" I love that kid and I'm glad she's mine! You have to get breath right strips for your nose! I've been suffering from allergies since February and this purchase was a game changer for me!! Aww she is so sweet. Hope you feel better soon! Christine, I will have to try some breathe right strips. Thanks! And thanks Tracy! I just noticed all your comments were going to my spam folder? I just made sure they were all published. I hadn't noticed, because I read them in my email. Sorry about that!